In the course of your PC’s life, as you install and uninstall software, create or delete documents, etc…, files become fragmented across the hard disk, blocking memory space and slowing down your computer’s processing speed – you may not have noticed, but defragment your hard disk, and you will see the difference immediately. Defragmentation is the process by which files are rearranged so that they can be recognised and processed by your computer more easily, and previously locked memory space is made available again, vastly increasing your computer’s performance. Often neglected, defragmenting hard disks should however be a regular maintenance task for everyone owning a PC. 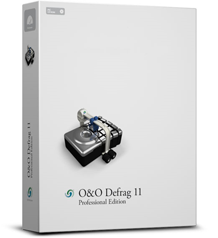 There is a multitude of software available to assist you, and Defrag 16 is O&O’s latest version. It improves the performance and stability of Windows operating system and can be used on computers and servers. It offers a generous amount of options as far as customisation is concerned which makes it suitable for most situations and IT set ups. One of the great advantages of this family of software by O&O is how configurable it is, and this version has retained this feature. Users can choose from eight possible pre-programmed defragmentation strategies or create one to suit their specific needs. You don’t have to have your files reorganised by name, you can choose instead to have them by access date or last modified date, to name but a few options. Like his predecessors, Defrag 16 was conceived to make defragmentation as easy and convenient as possible. It can be programmed to run at specific times without the need to supervise the defrag sessions, or it can be scheduled to run when your computer is less active, for example when the screen saver comes on, indicating that your computer is idle, or in power-saving mode on a laptop or a netbook. This enables the software to take advantage of downtime and run in the background without affecting the computer’s performance or disrupting your working day. One of the criticisms of previous versions of O&O Defrag was that it could be slow to start up and defragment. In this latest version, the algorithms used have been accelerated, and O&O states that it has substantially reduced the time required for a defragmentation, in some cases by up to 40% – users are still divided as to whether or not it has really improved on that score. Defrag 16 also launches more quickly and supports defragmentation of locked files better. Constant sorting of files on the hard disk means that Windows can access and read them more quickly, and O&O claims that this can accelerate all the read and write accesses by up to 100%. Several drives can be defragmented simultaneously, and Defrag 16 prevents new fragmentation from occurring as well as increasing the chances for recovering lost data. Unlike its predecessors, the new version of O&O Defrag is fully compatible with Windows 8, so it is one issue less for users considering an upgrade when the new operating system is released on October 26, 2012. It still supports Windows 7 (32 bit), Windows 7 (64 bit), Windows Vista (32 bit), Windows Vista (64 bit) and Windows XP. O&O is promoting a new feature of Defrag 16 as “the” major addition of this version: the “Time View”, which shows you the performance optimisations achieved by specific defragmentation actions. The principle behind this is that by showing you how the programme is working and what has been most beneficial to your hard disk, you will be better equipped to make informed decisions about future defragmentation strategies. Although it is a nice feature, previous versions already came with robust reporting capabilities and the benefits of Time View are still to be debated. On the other hand, graphics and statistics provided by Defrag 16 are very useful to show what the program is doing for your system with a “before-and-after defrag” comparison. The reports produced at the end of each defragmentation session provide a list of the files that were fragmented, as well as a clear and useful map showing each type of files that was optimised and defragmented on each drive. Overall, it is undeniable that O&O have delivered strong improvements with this latest version, also making better use of TRIM (a command allowing operating systems to inform solid-state drives (SSD) of the data that can be wiped) to optimise SSDs. If this is your first defrag tool, O&O Defrag 16 may not be the software to recommend as it is quite sophisticated, but it is not totally out of reach either thanks to its well-designed user interface which makes it fairly intuitive and user-friendly to the novice. Although it offers many possibilities for customisation, its pre-programmed defragmentation scenarios mean that the software can be used without extensive knowledge of computing. Ample customer support is also available, through the user’s manual, and online and email support. Frequent updates can be downloaded and those are usually free, so O&O Defrag 16 is well worth considering as it does offer many useful tools which you can learn to use in time. For IT professionals, some may feel that the customisation options are not advanced enough and that features such as network support would be useful but Defrag 16 remains one of the best disk defragmenter on the market. Its price is also attractive, as you can purchase a one PC licence for £29.99, a 3 PC licence for £49.99 for, and a server licence for £199 directly from O&O’s website. With a bit of research, you can find some special deals and get it even cheaper, which makes this software one of the best value-for-money in its genre– there’s a plethora of free disk defragmenters, but they don’t benefit from any support should you have any difficulty using them. If you are not sure whether Defrag 16 is for you, you can download a free trial for 30 days before having to commit..
Visit http://www.oo-software.com/ for more details. Supports Windows Vista, 7 and XP and 8 Support. Screen Saver Mode – Defrags when your computer is idle.